While cruising the WNY Heritage Press site recently for some old Buffalo pics, I found this short article chronicling a new city initiative when Buffalo was poor and jobs were scarce - urban farming! 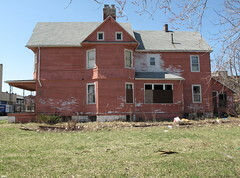 Here's the link - The Depression of 1893-1897 Buffalo's Urban Farms. 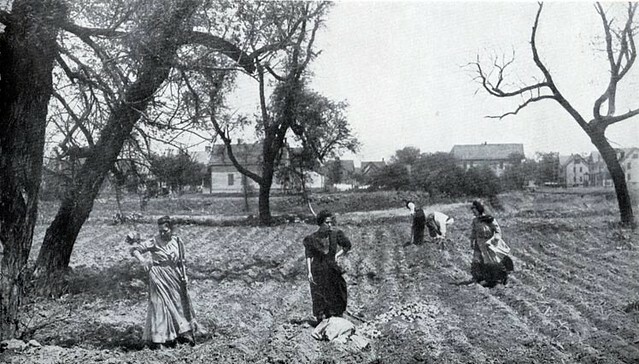 In 1895, Mayor Edgar Boardman Jewett, newly elected mayor of Buffalo, proposed that Buffalo follow the example Detroit which had utilized vacant land in the city for use by poor people as farms. 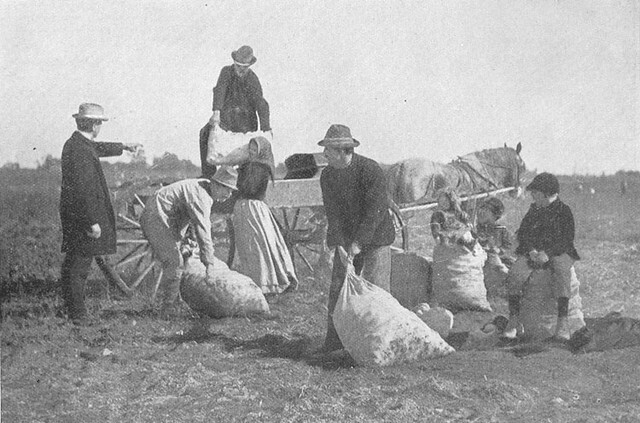 The city would solicit the loan of such land from landowners, prepare the fields by having them plowed, and provide the seeds. During the depression on 1893 Mayor Pingree of Detroit was nationally known for his reformist policies. Pingree expanded the public welfare programs, initiated public works for the unemployed, built new schools, parks, and public baths. He gained national recognition through his "potato patch plan," a systematic use of vacant city land for gardens which would produce food for the city's poor. 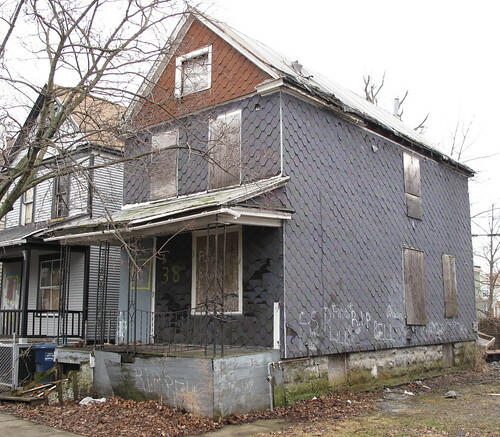 Today Detroit is the country's poorest city. In Michigan, elected officials on a state and local level now embrace what was widely successful over a hundred years ago - see, Farm Report - From Detroit. The issues swirling around poverty and food security in Buffalo - the country's third poorest city - are just as severe and the human impact is just as acute. Buffalo followed Detroit's public policy success in 1893. Why not in 2009? I went to the top of one my favorite parking ramps yesterday (corner of Goodrich and Ellicott) and grabbed this shot looking east towards Michigan Avenue. 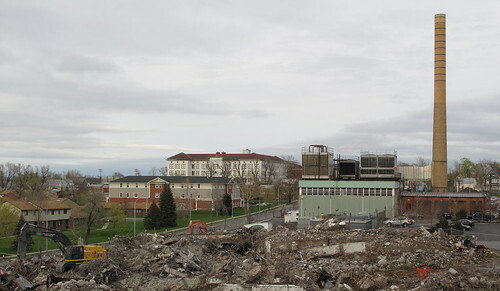 The demolition is still taking place here along Goodrich Street in preparation for the Kaleida/UB project I posted about a few weeks ago - Medical Campus Meets Midtown. Investment in the immediate neighborhood is accelerating. In the pic, City Honors is center left, where a $40m renovation is underway. The new brick and two tone vinyl building nearby fronts on Michigan Avenue. I first posted pics about it three years ago, here. I'll be adding additional pics to my Kaleida/UB flickr series as this project develops. 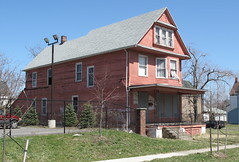 See the following posts for additional background information - Kaleida Expands, Again and the Hamlin House Demoltion also on Goodrich Street, from October 2006. The weekly Artspace Neighborhood walk is tomorrow at 10am and lasts an hour. Here the details and a flickr series of recent Saturday morning pics. 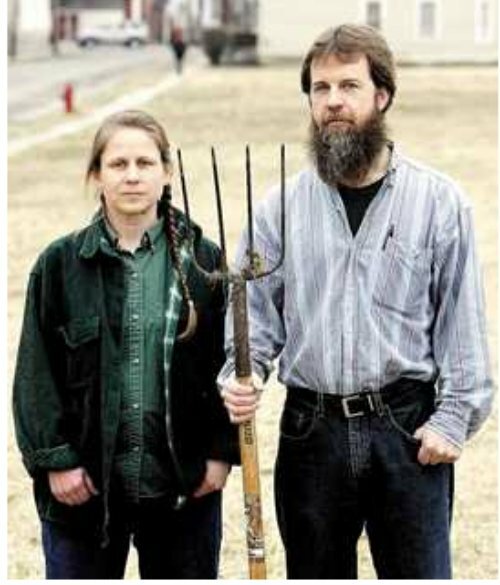 Kirk Laubenstein told me earlier this afternoon that the Grassroots Garden board has approved the application that Mark and Janice Stevens submitted last week for their urban farm project on Wilson Street. fixBuffalo readers will recall last week's post about the city's newest urban farming initiative - Wilson Street Urban Farm. The next step is Common Council approval and a signed lease agreement with the Dept. of Economic Development. Approval for the signed lease agreement has been reportedly signaled by Commissioner Brian Reilly. 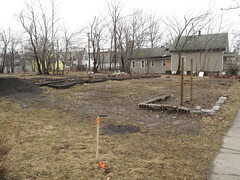 The State of Michigan Land Bank Fast Track Authority is making its inventory of nearly 7,000 vacant lots statewide -- 6,000 in Detroit alone -- available as community gardens via its Garden for Growth program. 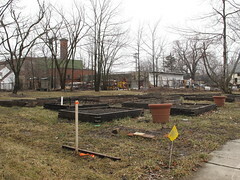 "Our goals, in addition to finding productive uses for these vacant plots, is to support the Governor's Urban Food Initiative," says Carrie Lewand-Monroe, the Michigan Land Bank's executive director. "We're hoping to help allow folks in urban areas to access fresh, healthy food." The way it works is that any community member can apply to garden a lot in the Michigan Land Bank for $50 for one year. At that point, participants are able to put in an application to purchase the land. This lease-first approach is considered a "best practice" for programs of this type for two reasons: It allows time for the garden to be established and it keeps it tax-free for the first year. The Land Bank is willing to flexible with lease terms; it is working with The Greening of Detroit on five parcels that will be leased for five years. Any kind of garden is eligible: native plants, flowers and vegetables -- even a park, says Lewand-Monroe. All gardeners will be connected with the Greening of Detroit's Garden Resource Program for classes and planting material. Lewand-Monroe explains why 7,000 of the Michigan Land Bank's 8,000 properties are vacant lots: because they are all foreclosed properties that date back to 1999, which was when tax laws changed. "There aren't as many structures as the county would have," she says. They also administer a Side Lot program for vacant lots that are adjacent to occupied residences. To search for a property, use the Land Bank's web site Search for Property feature. The application for the Garden for Growth program is also available on the site. 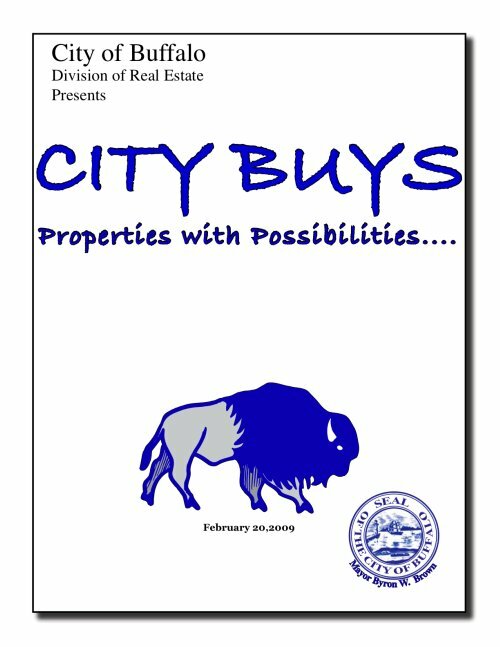 A Land Bank for Buffalo? - See Today's NYT! An Effort to Save Flint Michigan by Shrinking It appears in today's New York Times. The article highlights the work of Dan Kildee and the Genesee County Land Bank - the go-to resource for best practices in managing urban decline. 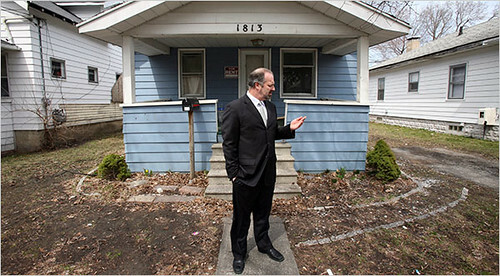 Dan Kildee in front of his childhood home, Flint Michigan. NYT photo. Dozens of proposals have been floated over the years to slow this city’s endless decline. Now another idea is gaining support: speed it up. Instead of waiting for houses to become abandoned and then pulling them down, local leaders are talking about demolishing entire blocks and even whole neighborhoods. 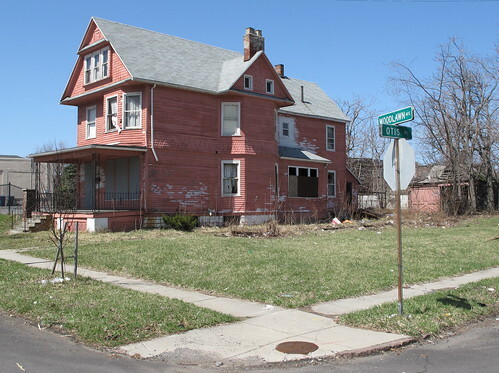 The Buffalo News had a related series of articles last year about Buffalo's housing crisis. See Living on the Edge where I floated the idea that city services in certain sections of Broadway/Fillmore should be shut down. See also - Our Urban Prairie, Summer 2008 and Getting Smarter about Decline. Four years ago the Berger Commission was charged by Governor Pataki to rethink how hospitals and nursing homes delivered health care in New York State. The results came in and the commision's recommendations became law in 2007. The state directed Kaleida to close Millard Fillmore Gates Hospital in Buffalo's Delaware District and open a vascular institute. Ground was broken recently. 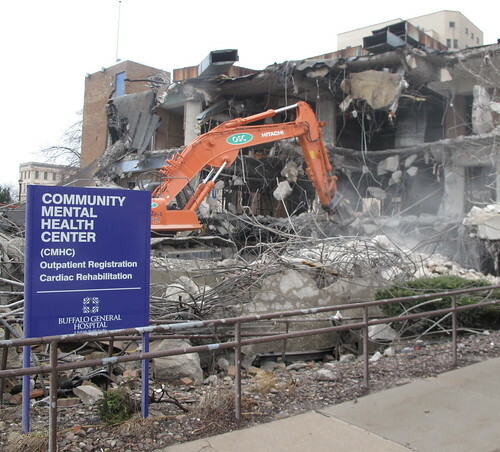 The demolition of the Community Mental Health Center's building on Ellicott Street between Goodrich and North Streets is the first visible sign of a project that's expected to four years to complete. Canon Design is taking the lead on the first of four buildings which are expected to be completed in 2013. 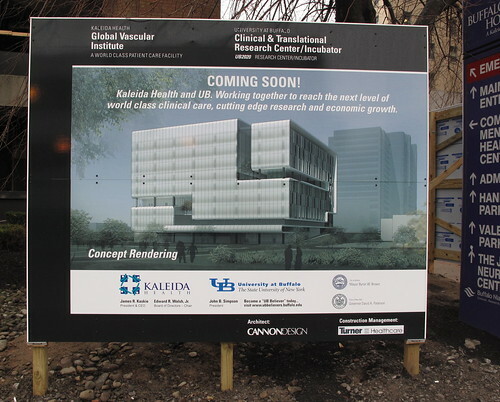 This will house Kaleida's Global Vascular Insititute and UB's Clinical Translational Research Center/Incubator. According to the Draft Generic Environmental Impact Statement (DGEIS) that was released late last year - here (.pdf file after the jump) - three additonal structures will be built in the North End of the Medical Campus. These include - a 200 bed skilled nursing facility (replacing Millard Fillmore Gates), a 10 story Ciminelli Medical Office Building and a 1600 space parking ramp which is the size of the new Blue Cross parking ramp behind City Hall. In addition to the four new structures which are scheduled to be built by 2013, there are a number of other interesting developments taking place. Goodrich Street will be closed permanently between Ellicott and Michigan Avenue. This will allow, according to the DGEIS, an integration of emergency services between Buffalo General Hospital and the new GVI pictured above. The DGEIS also specifies a number of pedestrian bridges connecting the various new buildings, at least one of these will be 40' wide. The site for the 1600 space parking ramp hasn't been located according to last year's DGEIS. Late last year I posted about a number of demoltions that were - and still are - anticipated according to this plan. Here's a site map indicating the proximity to additional development on this side of Main Street. City Honors (outlined in red) just to the north of the Medical Campus is undergoing substantial renvovations and will expand its athletic fields by the time it re-opens in September 2010. Fascinating developments, just East of Main Street. I'll be covering various aspects of these projects in the months ahead. How do you create green space in one of the most industrial states in the U.S.? Tom Woiwode knows. As director of the Greenways Initiative, he's raised more than $125 million to build and maintain trails, orchards and beautiful greenery throughout Southeastern Michigan. He'll tell us how greening a city can help build community and civic engagement. I noticed this short YouTube clip featuring Buffalo's Mayor Byron Brown this evening. Here he's addressing the City's current position reagarding the Wilson Street Urban Farm. In the current issue of Artvoice - No Pioneers is a great read. Drive down Fillmore Street between Sycamore and Broadway and you’ll see boarded-up buildings, dilapidated homes, and ubiquitous empty lots. By anyone’s estimation, it’s a rough neighborhood. But walk into 812 Fillmore, and you’ll find dozens of shoes neatly paired in the entranceway, and a warm, welcoming living room filled with children doing their homework, cooking and playing. This is the home of Mark and Janice Stevens, a couple who moved from a farm in Wyoming County to the East Side of Buffalo last year. While checking out Dyngus Day events around the Broadway Market and Central Terminal this Monday, take a moment and drive down nearby Wilson Street. Here's the Wilson Street Urban Farm Facebook Group. I went over to Wilson Street early this afternoon to take a closer look at the Steven's farm location. The first pic looks north on Wilson Street and the second is looking south towards St. Stanislaus. While walking on Wilson Street I counted three houses on the Broadway/Sycamore block, one appeared to be occupied. Across the street there were 14 garage/barn structures. Two appeared to be in great shape and the rest, in various stages of decay. I don't know anything about the ownership of the property on Fillmore (next block over) except that Council President David Franczyk lives on the block a few doors aways from this location - Death at 830 Fillmore Avenue - that I visited in January. I spoke the Mark Byrnes, Common Council President David Franczyk's staffer while leaving Wilson Street earlier this afternoon. He informed me that all the calls coming into the office are overwhelmingly positive and supportive of the Steven's plan and vision for this part of the planet. Later I spoke with Judy Einach the Executive Director of New York Sustainable Agricultural Working Group. She's very supportive of this urban farming project and shared the following statement in an email with me. The administration seems to think economic development means houses. Get a little out of town into rural areas and farming is the economic development base. Farmed well that 2 acres could be a terrific business venture. Now there are some economic advantages attached to farmland that might decrease what the city can take in from taxes but for so many reasons this makes more economic development sense than does housing on that land. Besides a great little farm would probably be such an asset it would raise the real estate value of the surrounding properties. Agriculture remains the number one industry in NYS. We in Erie and Niagara Counties have too many policies restricting farming compared to other counties. Very backwards given food system trends. I'll be taking a closer look at and running a property ownership analysis on nearby streets in the next few days. Seems like this part of Broadway Fillmore is full of city owned vacant parcels. Many of my Urban Prairie pics were shot in the same neighborhood over the last few years. Meanwhile, consider joining the Wilson Street Urban Farm Group on Facebook. Read Chris Byrd's posts over at Broadway Fillmore Alive and check out the latest comment stream on Buffalo Rising about this project - Urban Farm vs Housing. Urban farming makes sense. Today the economy and food security issues intersect in such a powerful way in a shrinking city that ideas like this should be embraced. Here in Buffalo this is a classic case of existing reality out pacing public policy. Two very interesting and related cases crossed here on the City's east side recently. First, the ultimate fate of the Stevens family's plan to farm a couple of acres of vacant land near the City's historic Broadway Market hasn't been decided. There's a growing comment stream from a Buffalo News blog post - Down on the Farm - that shouldn't be missed. And Artvoice editor Geoff Kelly has taken the lead and turned the City's decision to deny their request into a larger piece about city planning and the wholesale lack of vision that the Brown Administration has regarding innovate landuse planning. His post shouldn't be missed either - Moratorium: No More New Builds. Second, last year Buffalo ReUse established a community garden on two empty lots over on Eaton Street. Here a couple of pics I snapped recently. Make sure to check out the garden's bounty from the Buffalo ReUse flickr stream and slide show of the Eaton Street Community Garden. Community Garden - Belmont Building Lots! While examining the Belmont Shelter's Neighborhood Plan recently - see Part I, Part II, Part III, Part IV and Part V - I noticed that two of Belmont's houses are planned for this little piece of paradise. Buffalo ReUse folks have recently confirmed this. One of the many issues here is that there was zero public input into the site selection process for the Belmont Plan. When there are literally hundreds of empty city owned lots in the their target area. Why these two lots? The garden is contributing on so many levels to the neighborhood and providing food to people in one of Buffalo's poorest neighborhoods. Again - why these two lots? These issues - involving site selection for new builds - are central to how well Buffalo, a shrinking city, is managing decline. We're actually not doing that well. Public policy has to change. City officials need to address more effective land use policies that reflect the real desires, health and welfare of residents and people, like the Stevens, who want to move here. Is it time for a moratorium on the construction of new builds? 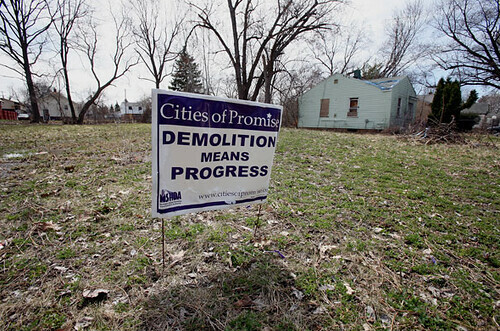 See also: Detroit Arcadia & Getting Smarter about Decline. I've been following this pedestrian bridge development on Ellicott for the last two years and most recently last November - Bridge Construction Update. 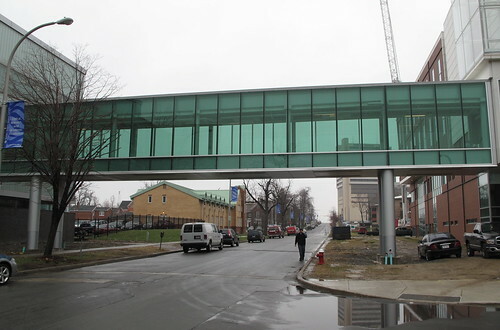 It finally links the new UB Bioinformatics building and Hauptman Woodward near Ulrich's. Now that the bridge is done, I'm left wondering how long we'll have to wait for a sidewalk along this section of Ellicott. Five years ago I started keeping a monthly photo record of the Woodlawn Row Houses, a unique heritage property located in Buffalo's Cold Springs neighborhood. I started blogging a few months later and have returned - except when the row has been under contract - on a monthly basis to tell the story. 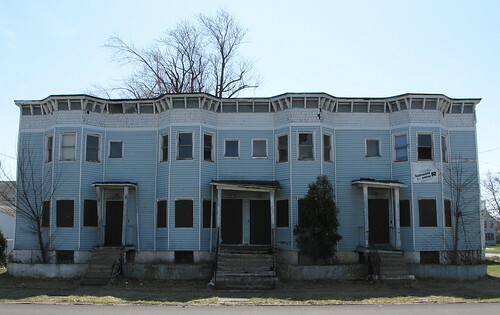 Last month I reported that the investment team that was the successful bidder at the City's special auction in September '07 has formally withdrawn their proposal to redevelop the Woodlawn Row houses. So it's back to square one. It seems clear that there's no comprehensive strategy for the successful marketing of City owned residential property. For example, the recently published City catalog - here - failed to include a number of properties, such as the Woodlawn Row Houses, that have economic potential. While I've shown these row houses to a number of people - from Buffalo to Laguna Beach - I'll continue my 'guerilla marketing' efforts using Craigslist to attract additional attention and a possible sale. Over the last four years three different groups have stepped forward and have attempted this project. Everyone has tried to retain the current eight unit configuration. Perhaps a new strategy is in order here. Returning the structure to its original form - four units, removing the siding, doing a fun exterior paint job that would clearly indicate four seperate houses and moth balling three units while working on one - might provide the right direction for the 'diy' self-financed plan for the successful rehab of this unique spot. Moving slowly through the project might be the right mix of energy, resources and time to resuscitate the Woodlawn Row Houses. If you're interested in taking a closer look at this project, let me know. Best-managed cities are creating innovative new solutions to the environmental issues plaguing their communities now. Sustainable Cities Collective is a moderated online community for civic sustainability officials and advocates who are on the frontlines in the struggle to build a sustainable future. There's a fascinating collection of thirty bloggers with innovate takes and analysis of what's happening and not in cities all over the planet. Check it out and join the conversation. The comment stream from the recent Artvoice post - fixBuffalo on Belmont Shelter - has accumulated a significant following since it first appeared. Check it out when you have a moment. While looking through the recent City Catalog of residential property for sale, I noticed this single family home at 26 Woodlawn Avenue (google map) is available to homestead - for $1. Here a few additional shots of 26 Woodlawn Avenue. Located less than 100' from Main Street with two recently renovated commercial spaces on the corner of Woodlawn and Main, 26 Woodlawn sits straight and appears structurally sound. The city lists the house at 2400 sf with four bedrooms. The walls of the detached garage appear solid. fixBuffalo readers will remember the $35m renovation of the Performing Arts High School just a block east of this location. For less than the cost of latte or a bus token this house is available for the right person; someone who sees the neighborhood's potential and wants to make this house their home. If you're interested in cutting through the homesteading maze and see this as an amazing opportunity and want to move into the neighborhood, let me know. I received the City's latest realestate catalog in the mail the other day. 111 City owned residential properties are featured. Many of these properties are available to homestead and are available for $1. Here's the link to the City's .pdf file - right here. I've also archived the file - here - in the event that it disappears from the City's website. It appears as though the catalog was first made available in late February. If you've purchased property from the city in the past or are currently involved in such a purchase and care to share some of your experiences, please consider leaving a comment to share with other readers. Thanks. 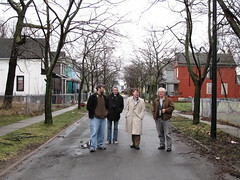 This morning's A/S Neighborhood Walk brought a number of fixBuffalo readers together for the first time. After taking a close look at some recent renovations on Coe Place we went over to Ada Place and had an opportunity to speak with a couple long time residents about their neighborhood. We ended up over on Harwood Place discussing the possible futures of 16 Harwood, a city owned single family residence. Saturday morning A/S Neighborhood Walks begin at 10am and leave from the Sonic Cafe. Click here for additional information and here for more pics. I posted about Ada Place in the context of Belmont Shelter's Neighborhood Plan - Part III last week. Six of the last remaining 18 houses on Ada Place are boarded and vacant. This house at 38 Ada Place caught my eye. After completing an ownership analysis of these stranded properties I learned that Rev. 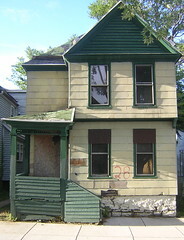 Richard Stenhouse, the former treasurer/secretary of Buffalo's Fiscal Stabiltiy Authority, and his organization, Bethel Community Development Corporation own 38 Ada Place. According to City records it was purchased seven years ago. Neighbors inform me that this single family house hasn't been occupied. I called the Department of Inspections at City Hall and learned that the last property inspection and Housing Court case was finalized prior to Bethel's purchase, seven years ago. fixBuffalo readers may remember Rev. 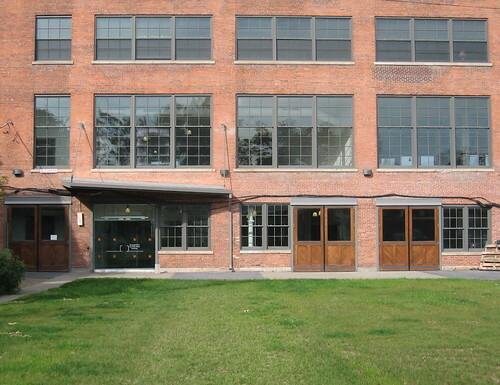 Stenhouse's prior Housing Court history involving four houses Bethel owned that were in derelict condition and adjacent to one of Buffalo's most exciting school reconstruction projects - Performing Arts High School. They were eventually demolished pursuant to a settlement with Housing Court, six months after the school reopened. See - Boarding Control and Rev. Stenhouse Steps Down. A number of calls to Bethel inquiring about the plans for 38 Ada Place haven't been returned. 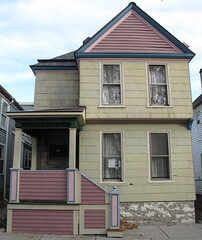 While recent successes on Coe Place demonstrate that a market exists for the renovation of smaller single family houses in Buffalo, 'demolition by neglect' seems to be in order for 38 Ada Place. 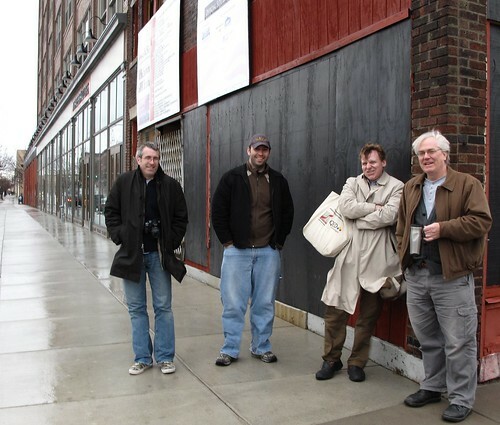 Saturday morning Artspace Neighborhood walks continue this Spring and begin at 10am. Meet-up is across the street at the Sonic Cafe - here's the map. There are a number of very exciting renovations and new developments happening in the neighborhood and periodically we'll be joined by a growing number of people who are moving into the neighborhood and making some unique houses - that would have been demolished and trucked off to a landfill - their home. Here's the link to recent Saturday walks around the neighborhood and a flickr series from last Fall's walks. Consider joining me on Saturday mornings at 10am and to learn more about this emerging neighborhood. The walk lasts about an hour - rain or shine! If you're interested in additional information check out two sections of my 'building & issues Index' - Coe Place and Artspace. This cultural assets map may help further orient you to the neighborhood. Technology has given birth to a new place, according to Dalton Conley, author of the new book Elsewhere, U.S.A.: How We Got from the Company Man, Family Dinners, and the Affluent Society to the Home Office, BlackBerry Moms, and Economic Anxiety . In it, he describes the way the American social landscape has changed from the 1950's ideal of a split between work and home, to a constantly connected 24-hour economy. He'll tell us what it means to combine work with leisure, and investment with consumption. And we'll speak with John Norquist of the Congress for the New Urbanism. He'll tell us about trends that are shaping urban development world wide and how the way our streets are laid out affects our daily lives. Geoff Kelly over at Artvoice has reported on Belmont Shelter's neighborhood plan - here. Check out the emerging comment stream.